Various attributes are all related to the horse. The specific attribute will be determined in the context. 2. 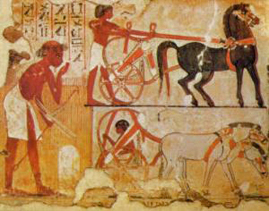 Horse is the hieroglyphic symbol for Noble. The horse represents the driving force that, when directed correctly, will lead to nobility. 3. Exceptional people are KNIGHTED by the monarch. This Egyptian concept of nobility is found in present traditions when, because of a person’s extraordinary accomplishments, this person is KNIGHTED by no other person but the Monarch. It is not a coincidence that the English word ‘horse’ is basically the same as the Egyptian deity Horus. 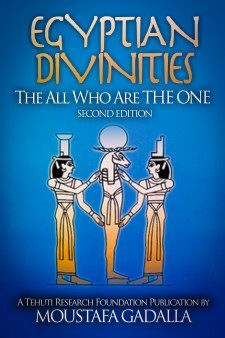 Horus means who he is ABOVE. 4. The horse is also a very beautiful and graceful animal. The Egyptian word MaHR means both a pony and a dowry—for a maiden is noble. 5. 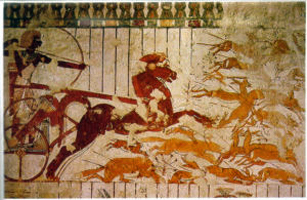 Depicted defeating forces of chaos.. 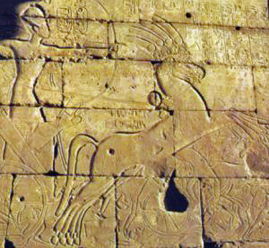 The divine man is depicted on Egyptian temples as charging and defeating chaotic forces, represented as foreigners and wild animals. These depictions are symbolic representations of the inner battle within between the forces of Good and evil. In mundane sense, Mounted Police everywhere use horses to guide and control crowds. Horse power is also used by police to dissipate disorderly crowds. We use the term ‘Horse power’ as a measure of energy. 6. In Egyptian traditions the human tongue is equated to a horse. The tongue is the strongest muscle in the human body. The driving force of the horse or tongue controls your destiny. The symbolism of the horse as the driving force is very powerful indeed. 7. Human and horses are so close that long ago, Ancient Egyptians used horse hair for both the strings and bows of their violin family of instruments. The sound of this instrument is as close as it gets to the human voice.